As if a day of revelry and community vibes at Hereford River Carnival was not excitement enough, this May London/Bristol D&B collective talent GUT (Grand Unified Themes) return to Hereford for the first time in six years. The D&B/electronica hotshots are set to host an after-party to end all after-parties at The Speakeasy – at Hereford’s premier venue, Left Bank Village – as part of Hereford’s biggest community event. The collective, born out of London under the motto “if it can be mixed, we’ll mix it”, come from a variety of musical backgrounds including disco, hip-hop, D&B and garage and have hosted a multitude of events from intimate basement venues to the prestigious Lightbox Club. Spokesperson for GUT, Sam Herrera can’t wait to return to the city, “I am feeling particularly honoured to be hosting another event in Hereford since the first ever event that I hosted at the former Jailhouse 6 years ago. He’ll be bringing with him Bristol based D&B producers Dialekt and Imba, CL:19 and Praxis and Medic MC. Advance tickets are available from the Left Bank website priced at just £6.50 or on the door at £9.50. Hereford River Carnival and Wye Valley Brewery have selected a mighty name for this year’s limited-edition Carnival ale. 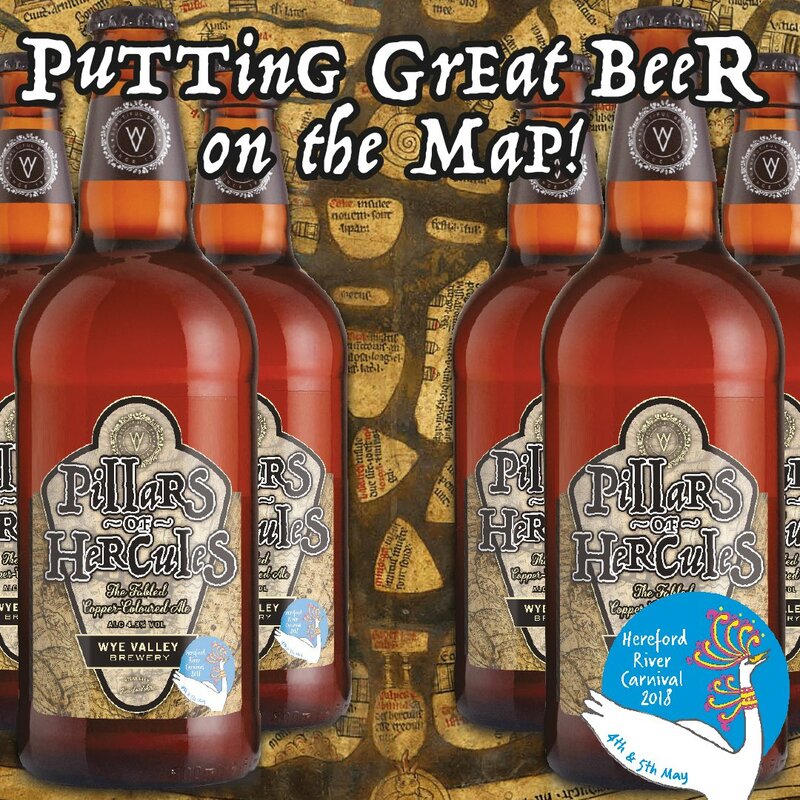 The brew will go by the name of ‘Pillars of Hercules’ one of the many myths featured in Hereford’s world famous Mappa Mundi which is once again a focus for the Friday night street theatre performance at this year’s Carnival on 4th and 5th May. Two Hereford Times readers suggested the name as part of the competition run in collaboration with the Carnival’s media partner, the Hereford Times. Over 250 ideas were suggested but it was Ian Nichol of Belmont and Owain Connors of Luston who came up with the winning name Pillars of Hercules, featuring the legendary strongman of Greek mythology. The lucky pair spent the day at the Wye Valley Brewery in Stoke Lacy creating the ale with Wye Valley Brewery’s master brewers on Thursday 5th April 2018. The Pillars of Hercules are depicted on the Mappa Mundi and can be found – as they can in reality – on either side of the Strait of Gibraltar at the mouth of the Mediterranean Sea. In Greek legend, Hercules created them during the tenth of his twelve labours when, with a single blow of his sword, he split the mountains that joined Africa to Europe. According to Abbie Gadd, Marketing Manager at Wye Valley Brewery, “We are really pleased with the name Pillars of Hercules. It sits well with the Wye Valley Brewery family of beers and is an excellent successor to last year’s Thirsty Mermaid. We look forward to welcoming the competition winners to Wye Valley Brewery to work with our head brewer to create a truly special ale for the River Carnival. If you haven’t bought one already there’s still time to buy a ticket for the City of Rotary Club Duck Race and the chance to win £1,000 cash as well as some other fabulous prizes. Watch out for the Rotary Duck sellers on Bishops Meadow, Castle Green and dotted around the site. All the proceeds go to some fantastic local, national and international charities including SHYPP, St. Michael’s Hospice, Hope Support Services, REMAP HFD, the Tear Fund and Polio Eradication. After all that activity if you’ve built up an appetite, the Satirday of the River Carnival this year will also feature an indie food village featuring the very best of the Herefordshire indie food scene including Beefy Boys, Rule of Tum, Rocket Kitchen, Peter Cooks Bread, Method Roastery, Trumpers’ Teas, Seb’s Cider, Absolute Cakery and the Old Granary Pierogi. We are delighted to welcome our very own artist in residence who will be on site all day capturing the Carnival capers in her sketch book. Harad Davies is currently studying Illustration at Falmouth​ University. She specialises in children’s illustration. 10:30am-11:30am As well as crewing a float on the river, the wonderful Shirleys are leading 3 special Shirley’s Wheels Bicycle Rides to the River Carnival starting from Tupsley, Belmont/Redhill, and Whitecross, with pick-up points along all routes – give them a cheer as they pass!